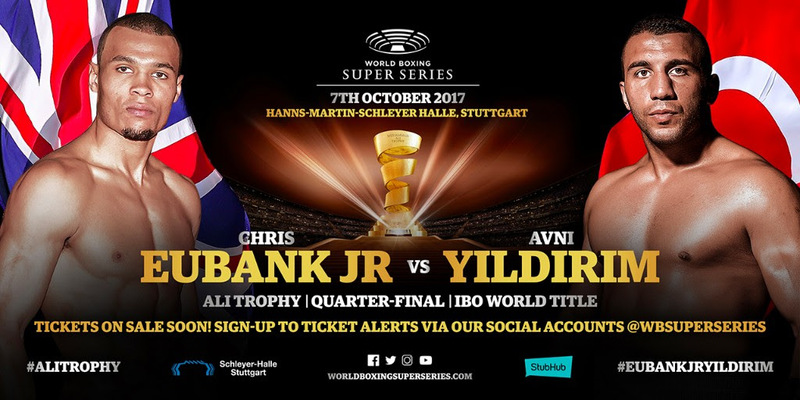 The spotlight shifts back to the super division for this Saturday’s World Boxing Super Series (WBSS) tournament when International Boxing Organization (IBO) Super Middleweight World Champion Chris “Next Gen” Eubank Jr. defends his title against undefeated challenger Avni “Mr. Robot” Yildirim in quarterfinals action, airing live in Canada exclusively on Super Channel from Hanns-Martin-Schleyer in Stuttgart, Germany. The “Eubank Jr. vs. Yildirm” card, starting at 2 p.m. ET / 11 a.m. PT,keeps Canadian boxing fans at ringside during the entire $50-million WBSS tournament, live this weekend from Germany and exclusively on Super Channel, which acquired the rights in Canada to broadcast the World Boxing Super Series from MP & Silva, a leading international media company that provides media rights, digital, technology and sponsorship services. The 28-year-old Eubank Jr. (25-1, 19 KOs), fighting out of the United Kingdom, is managed by his father, Chris “Simply The Best” Eubank (45-5-2, 23 KOs), who is a former World Boxing Organization (WBO super middleweight champion. In 2015, Eubank Jr. stopped Tony Jeter (20-4-1) in the second round to capture the Interim World Boxing Association (WBA) middleweight crown. Eubank Jr. captured his IBO title this past February, knocking out Renold Quinlan (11-0) in the 10th round. In his most recent action, the skilled Brit won a 12-round unanimous decision over multiple world champion Arthur Abraham (46-5) in his first and only world title defense to date. “This is the first fight for me in this tournament and I am here to make a statement,” Eubank Jr. said. “I am the man; I’m the man to beat. There will be no mercy for Yildirim. I am here to win, I am not here to make friends. I am not here to look pretty and be a celebrity, I am here in this tournament to become the champion. I am very much looking forward to this fight. I think it is a great match-up. Styles make fights and the reason I picked this man at the Draft Gala is that he is a fighter. He comes forward. He is very active, he is very open, he takes risks, which he will pay for this fight. I can’t wait! Upset-minded Yildirim (16-0, 10 KOs). 26, is the reigning World Boxing Council (WBC) International Silver super middleweight champion, which he originally captured two years ago, taking a 10-round decision from former world champion Glen Johnson (54-20-2). Yidirim has successfully defended his title five times against Janne Forsman (KO1), Walter Sequeira (17-2), Jackson Junior (KO2), Schiller Hyppolite (TKO3), Aliaksandr Sushchyts (KO12) and Marco Antonio Periban (DEC12). Five exciting bouts on the “Eubank Jr. vs. Yildirim” card, promoted by Sauerland Event, will air in Canada exclusively on Super Channel. The Eubank Jr. vs. Yildirim main event is scheduled to start at 5 p.m. ET / 2 p.m. PT. In the 10-round co-featured event, Germany’s undefeated prospect Stefan Haertel (14-0, 1 KOs) faces Ukrainian challenger Viktor Polyakov (13-1-1, 6 KOs) in a WBSS super middleweight substitute fight. Fight Preview: Tony Bellew v David Haye II – Can Haye Make It 1-1?